It’s no secret that I’ve been lukewarm on Samsung devices for the last few years. My Samsung Galaxy Nexus was one of the best devices I’ve ever owned. When it finally died, I moved up to the Samsung Galaxy Note 3 which had awful antenna design problems and TouchWiz, which soured me on Samsung for a couple years. Since then, I’ve reviewed the Galaxy S6 and Galaxy S6 edge+. The S6 was too small for me, while the S6 edge plus had the curved screen that was much more attractive than functional for me. My friends at Verizon offered to let me play with the Galaxy Note5, and I was excited to find out how I’d like the big, flat phone from Samsung. The phone feels like a premium device in my hand. It’s easier to hold than the S6 or S6 edge+, even with the unfortunately glass back. The signature feature of the Note line from Samsung is the stylus, and the Note5’s S-pen makes it easy to take handwritten notes or select and manipulate screenshots. The display is gorgeous. The 5.7″ display is smaller than my Nexus 6 but bigger than my LG G3. It feels just right to me, and Samsung has solved the biggest problem I have with OLED displays – the red tint. I’ve always preferred IPS displays because whites seem whiter. The OLED display on the Nexus 6 seems red. Amazingly, the Note5 seems even whiter than the IPS display on my LG G3. All three phones were set to full brightness for this photo. Samsung still puts TouchWiz on top of Android. It’s still frustrating, but installing the Google Keyboard and Action Launcher 3 makes using a Samsung phone seem much less suffocating than it did back in the Note 3 days. There is a ridiculous amount of pre-installed apps that can be disabled but not removed. While I was reviewing the Note5, Verizon pushed out the Android 6 update, which enabled Google Now on Tap and better battery management. The notification shade feels much cleaner now as well. Samsung is known for its fast cameras, and the cameras on the Note5 is no slouch. From what I can tell, the 16 MP main camera and 5 MP front camera are the same as those on the Galaxy S6 and S6 edge+. The camera is very quick to launch, especially using the double-press shortcut of the home button, and the myriad shooting modes are easy to understand and use. As usual, I’ll have an unedited gallery at the end of this post showing real-world example pictures I took with the phone. Here’s a short video example from a round of golf showing my brother-in-law with a difficult shot. Speaking of the home button, the Note5 has one. That’s a big deal-breaker for me – I’ll never know why Samsung went back to physical buttons after the Galaxy Nexus didn’t have them, but they’re one of the only manufacturers still clinging to that poor design decision. However, if you’re going to pollute the front of a phone with a button, you might as well build an amazing fingerprint reader into it. I’ve only used a couple of phones with finterprint readers, but Samsung’s readers are fast and consistent. There’s no expandable storage on the Note5 and the 3000 mAh battery isn’t upgradable. My review unit was 32 GB, which simply isn’t big enough for me. I’m running about 400 episodes behind on my podcasts, so Doggcatcher‘s using over 15 GB. The phone reserves 8.5 GB as system memory and my apps use nearly 7 GB, which doesn’t leave much space for pictures and video. If you’re buying a phone without expandable storage, always opt for at least 64 GB. It’s 2016, and we shouldn’t have to plug our phones in like animals to charge them. The Note5 features two different wireless charging standards, so it’s completely compatible with all my existing wireless charging stations around my house. It also supports fast charging, so when I was in a hurry, I could get enough power in it to finish the day. 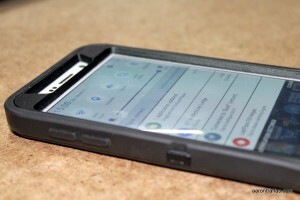 The Otterbox Defender case interferes with accessing the notification shade. I’m pretty active with my phones, so I always use a case with a belt clip. Verizon sent me an Otterbox Defender to use with this Note5 and I have to say it’s not the case for me. It’s plenty rugged and durable, but there is one small design flaw that makes using the phone with this case quite irritating. As you can see in the picture, the case at the top of the phone protrudes up at a sharp angle immediately superior to the upper edge of the screen. Triggering the notification shade actually requires effort, since it’s actually difficult to touch the very top of the screen. The Note5 performed great for me. It’s very snappy and responsive. Bluetooth worked great with the Moto360 smartwatch that Verizon also sent – I’ll be posting a review of it tomorrow. I did notice some issues with play and pause sometimes not working with my LG Tone headset, but I’m not sure if that was a problem with the phone or if it was a configuration issue with Doggcatcher and the lock screen. In summary, when I send the phone back to Verizon tomorrow, I’m going to miss a few things. I won’t miss the physical buttons or TouchWiz, nor all the pre-installed apps. I am, however, going to miss the fast camera and fingerprint reader. I’ll miss the gorgeous display and snappy performance. 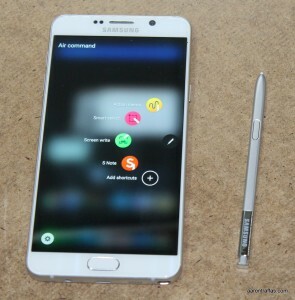 If I were to own a Samsung phone and had to choose among the S6, S6 edge+ and Note5, I would definitely get the Note5 – but I’d get the 64 GB model. As always, for pictures taken with the phone, I’ve done no editing. The pictures are as they were when they came off the camera. You can view the full version by downloading it from the attachment page. I’ve been a fan of LG phones since the G3, which I called the best phone for the farm in November of 2014. I still have mine and was using it as recently as a couple months ago when I stopped farming and switched back to my Nexus 6. Verizon sent me a G4 to review for a few weeks last spring, and I called it the perfect phone for 2015. Now I’m torn. 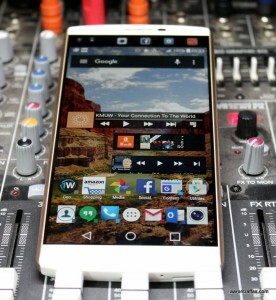 LG’s V10, a recently released dreadnought of a phone, has got me wondering if I spoke too soon. My friends at Verizon sent one to me a few weeks ago to review, and I’ve found it to be a great size with wonderful cameras and a unique second screen that’s a refreshing innovation. The V10 is very big, but LG knows the secret to building a big phone is to make it tall but narrow and not too thin. The V10 is actually as tall as the Nexus 6, but it’s narrower in a very good way – it feels great in the hand. The IPS screen is beautiful. 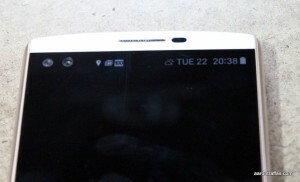 Whites are bright and white, instead of the dull off-white with a reddish tint that I notice in the OLED screens on Motorola and Samsung phones. At 5.7″, the screen is bigger than everything I’ve seen except the Nexus 6. 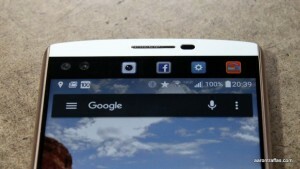 The most noticeable feature of the V10 is the second screen. It’s always on and shows different content depending on the context of the phone. I set it to show date and time when the primary screen is off and to show recent applications when the main screen is on. It’s an intriguing innovation to phone designs that have been relatively stagnant for years. Like the G3 and G4, the V10’s power and volume buttons are on the back of the phone instead of the sides. This is the place where these buttons should be located – other manufacturers need to catch up. Unlike the G4, the power button on the V10 doubles as a fingerprint reader. I was disappointed in it compared to the fingerprint reader on Samsung’s Galaxy S6, as the fingerprint reader on the V10 worked only about half the time while the S6 seemed to read my fingerprint quickly and reliably. The V10 comes with Lollipop, an older version of Android. It’s also loaded with a ton of preinstalled software from LG and Verizon. The NFL Mobile app started sending me notifications before I could even update the apps from the Google Play Store for the first time. Like most phones, it takes a while to replace the keyboard with SwiftKey and the launcher with Action Launcher 3, as well as to disable all the excess LG and Verizon apps, but it’s well worth it – the phone will run faster and longer with fewer unnecessary notifications and prompts. 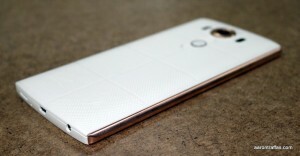 LG bills the V10 as the phone for media creators. The camera on the G4 was arguably the best camera on a phone so far this year, and I think the camera on the V10 is every bit as good. It doesn’t seem quite as fast to react as the G4, which is odd since the V10 has more memory. The output of the cameras, though, is extraordinary. The front cameras – that’s right, the V10 has two front-facing cameras – are both 5 MP, but one is a standard lens and the other is a wide-angle, making it the perfect device for the selfie-obsessed. 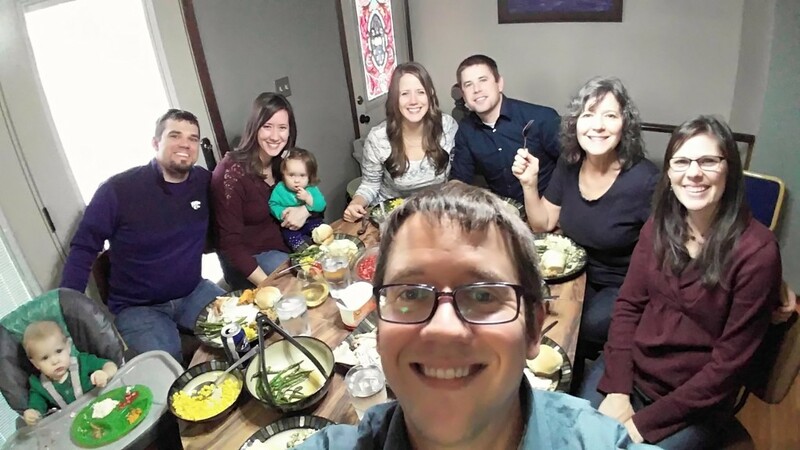 I’m not big on selfies myself, but I know I wouldn’t have been able to fit everyone in this Thanksgiving picture without the wide angle front camera. The rear camera features optical image stabilization and laser autofocus, as well as full manual controls for anyone not satisfied with automatic settings. The UHD video is remarkable. The audio was well balanced and clear, and the video is very clean. Here’s a song called Lonely Misses Me that I recorded with the video camera. I didn’t change anything other than trim, fades and titles. I was disappointed that there’s a limit of five minutes on the length of UHD video recordings. I don’t remember such a cap on the Droid Turbo 2, but I’ve read that other phones have similar limits. Battery life wasn’t great, but the 3000 mAh battery on a phone that’s this fast with a screen this big means that LG wasn’t trying to win the battery longevity game. They built the phone to support Quick Charge 2, which charges the phone extremely fast. More importantly, they built the phone with a removable battery and put contacts beneath the removal battery cover to support wireless charging. I simply don’t understand why other manufacturers don’t offer these options, but I’m glad LG does. The V10 isn’t going to be a great fit for everyone. It’s really big, and considerably more expensive than other recent phones – it’s currently $672 from Verizon. However, with specs like this, it’s understandable that it’s so much more expensive than the G4, which is $552 at the time of this writing. Pricing aside, the cameras on the V10 are killer. They take gorgeous, high resolution pictures and videos. The screen is big enough and bright enough to see them clearly, without the off-white discoloration inherent to other screen types found in the competition. The phone is fast enough to edit the pictures – and even the UHD video – directly on the device. The wide-angle front camera makes it easy to fit everything in the shot. In short, the V10 feels like a phone built around the cameras and makes the perfect choice for someone who likes to take important pictures on the go and doesn’t want to compromise. Motorola’s original Droid phone was my gateway into the world of Android and I’ve never looked back. 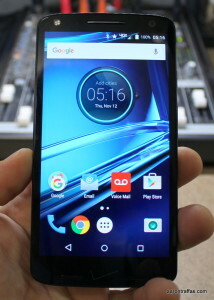 Verizon’s released many Android phones from different manufacturers since 2009 under their Droid line, and their latest is the Motorola Droid Turbo 2. My friends at Verizon sent me an invite to watch the release announcement late last month and sent me a review unit to play with for a couple weeks. 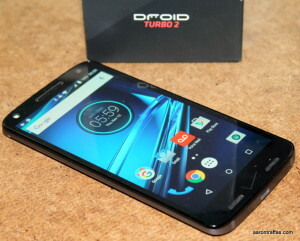 The Droid Turbo 2 is the successor to last year’s Droid Turbo, which I found to be a very good device. The processor is faster and the battery is a little smaller. The Droid 2 has an SD card slot for additional storage, which is always a crucial feature, especially when the phone only comes with 32 GB storage. 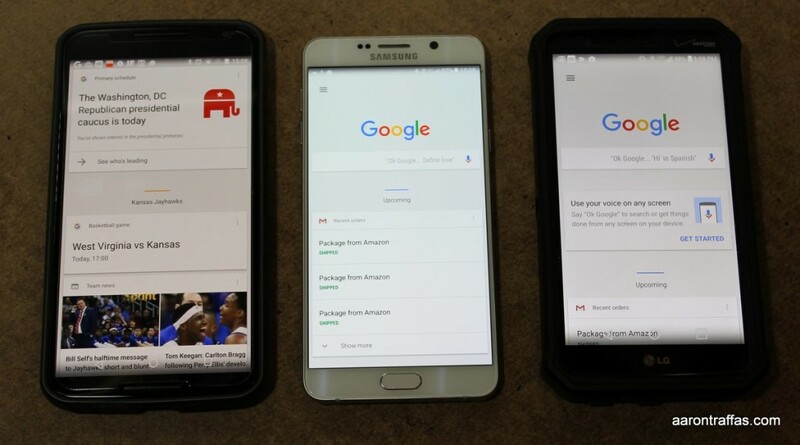 The biggest difference between the two phones is the screen. The screen is still an organic LED display, and at 5.4 inches it’s slightly bigger than the original Turbo’s 5.2 inch screen. The new Moto ShatterShield screen is guaranteed not to crack or shatter for four years. At the October release announcement, I saw the phone dropped flat on its screen onto a cinder block from shoulder height in front of a room full of reporters. Any company brave enough to do that demonstration is confident in its new screen technology. 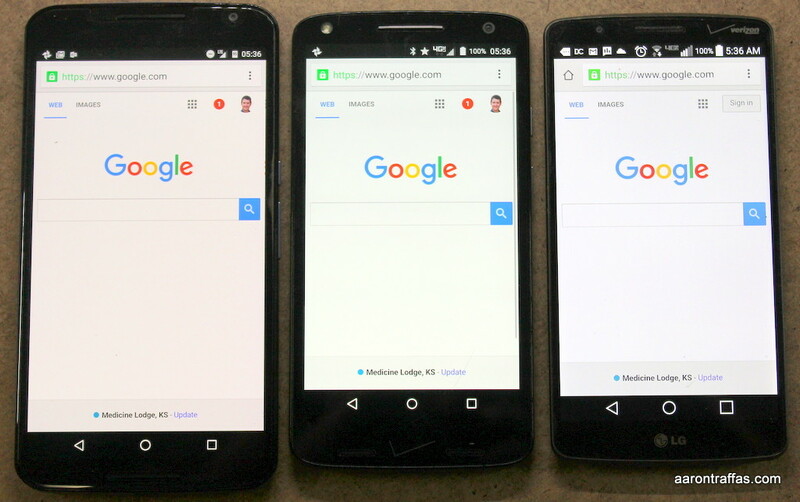 Here’s a comparison with the Nexus 6 (left), Turbo 2 (center) and LG G3 (right). The G3 has an IPS screen, so the whites are going to be whiter than the red tint that plagues OLED screens of the Nexus 6 and the Turbo 2, but the display on the Turbo 2 is much brighter and whiter than that of the Nexus 6. The 21 MP camera on the Turbo 2 is very good. The camera app is a little cumbersome to figure out, and the speed and picture quality in low light didn’t seem as good as the LG G4 or Samsung Galaxy S6, but it’s a good all-around shooter. The front facing camera is 5 MP and equipped with a flash. As always, I’ll have some pictures at the end of the review, but here’s a comparison between the LG G3 (left), the Droid Turbo 2 (center) and the Nexus 6 (right). I made no edits other than stitching them together, and the Turbo 2 is larger due to the larger picture size from the bigger camera. Click the collage to view or download the full size comparison. I was honestly a little disappointed with battery life. The best feature of the original Droid Turbo was the battery that would last a day. The 3760 mAh battery on the Turbo 2 is only 3.5% smaller than the 3900 mAh battery on the original Turbo, but the processor in the Turbo 2 is much better. I’m guessing that’s why I only made it until 3 p.m. on my first day with the Turbo. Here’s a couple of screenshots showing battery use on my first day. The first shot, captured at 15% left, shows the small amount of screen time while the second shows the final duration from about 5:30 a.m. to 3 p.m.
First full day battery life lasted from 5:30 a.m. to 3 p.m.
To be fair, I didn’t make it until noon with the M9, G4 or S6, so the Turbo 2 has the best battery performance of any phone I’ve seen this year. I’m also in intermittent coverage areas on the farm, which is hard on batteries. Now that I’m back at my desk next to a 4G LTE tower, I’m seeing significantly better battery performance. The Turbo 2 also features TurboPower, a quick charging system that boasts 13 hours of battery life in 15 minutes of charge time. Better yet, it supports Qi wireless charging, which is something that’s missing from several other recently released phones from other manufacturers. I’m just disappointed there isn’t a phone on the market that will last all day playing podcasts without needing to recharge, regardless of coverage quality, but the Turbo 2 is the closest I’ve seen in 2015. The software on the Droid 2 is excellent. Motorola’s recent phones – the Moto X and Droid Turbo – have had a very good Android experience, laced with Motorola’s custom enhancements, and the Turbo 2 follows in this tradition. Moto Voice allows you to customize the voice assistant activation phrase so you can use “talk to me, Goose” or “go go gadget” instead of the traditional “Okay, Google” phrase. The ambient notifications of Moto Display light only part of the screen to allow quick access to emails and messages without turning on the entire screen. Moto Actions are also quite convenient, allowing camera launch with a quick flip of the wrist or turning on or off the flashlight with a chopping motion. Moto Assist learns how and when you’re using the phone and adjusts phone settings accordingly. The camera app is a little confusing, as I mentioned, and I’m not a fan of the included launcher or keyboard. Android makes these things easy to fix, as there are third party camera apps on the market and the Google Now Launcher and Swiftkey keyboard are easy to install. I was disappointed to see the Turbo 2 launch with Android 5.1.1, since Android 6 has been out for a while now, but hopefully Verizon and Motorola ship the new version sooner than later. The Motorola Droid Turbo 2 is currently $624 from Verizon, but they’re offering up to $300 for the trade-in of an old phone, even if it’s cracked. All in all, the Droid Turbo 2 is a great phone, especially if you’re someone who is plagued with cracked or broken screens. It’s got a solid camera, a great battery compared to other phones on the market, and a screen that you don’t have to worry about breaking. I had some extra time with the Turbo 2 and recorded a video using the 4k 2160p setting on the camera. Here it is. I had some fun with my DJI Phantom 2 Vision+ quadcopter as I experiment with no-tilling grain sorghum into cover crop residue. 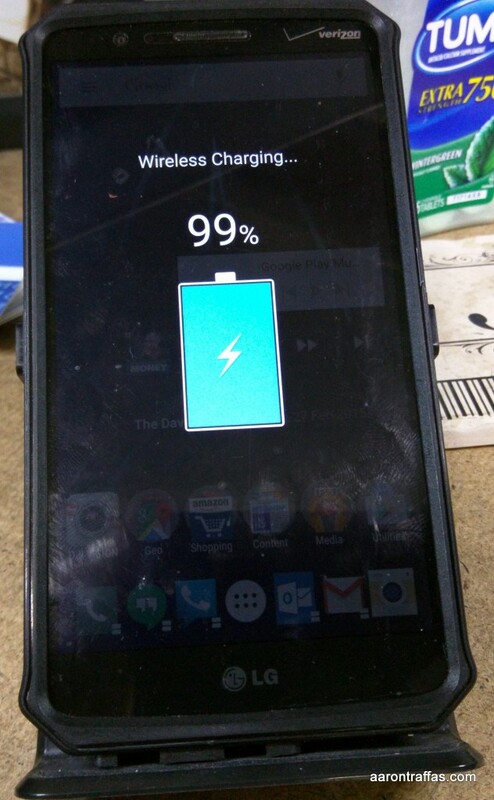 I recently bought another LG G3 to use with my Zerolemon 9000 mAh battery. It’s kind of a software downgrade, but the G3 is still the best Verizon phone for the farm and my Nexus 6 won’t last past noon. 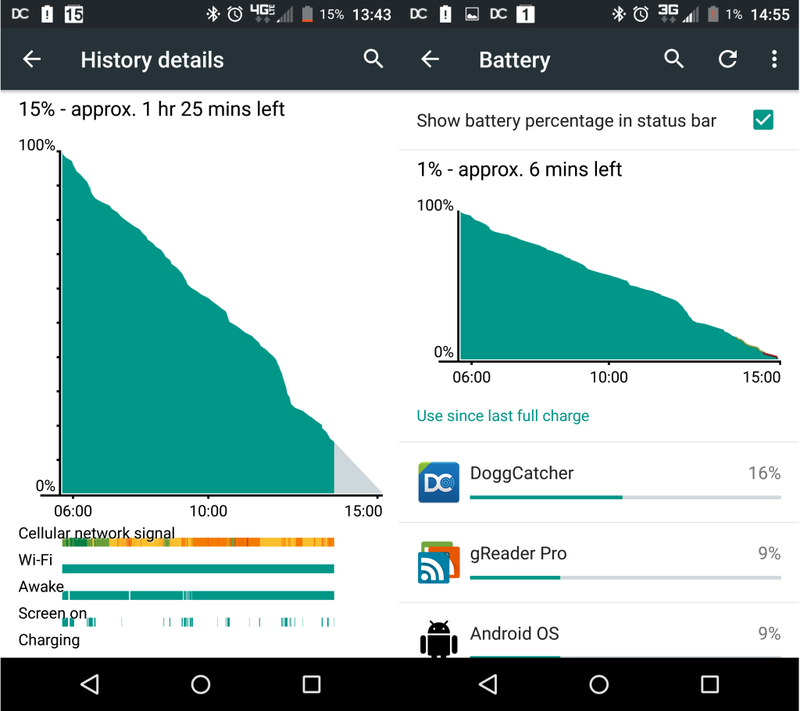 I’ve gotten used to Qi charging on my Nexus 6 in the last seven months, though, so I needed a way to get Qi charging to work with my Zerolemon battery. Forums weren’t much help, so I got out the soldering iron and decided that I was going to hardware a Qi charging coil to my G3 and battery. Once I got everything together and lined up, it turns out all it takes is a little tape and maybe some folded paper. Buy the Qi sticker from Amazon. Get the Zerolemon battery from Amazon. The sticker is designed for the normal case. It comes with a black sticker that you can discard. Don’t peel the adhesive backing from the charging coil. Align the contact points of the coil with the points on the phone. Tape it down firmly, making sure not to cover the laser sensor for the camera or the buttons which are nearby. Run the sticker up along the edge of the battery and lay it over the back. It conveniently lines up just right with every standing Qi charger I have, so tape it down. 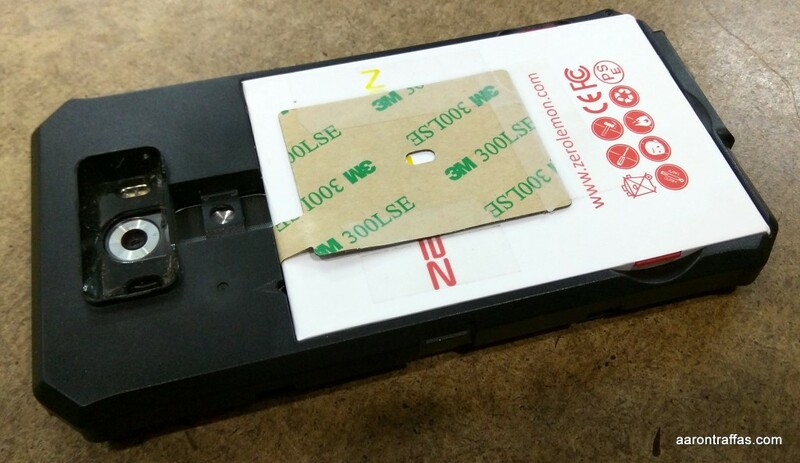 After a couple times removing the battery to get to the SD card, the tape became a little weak. 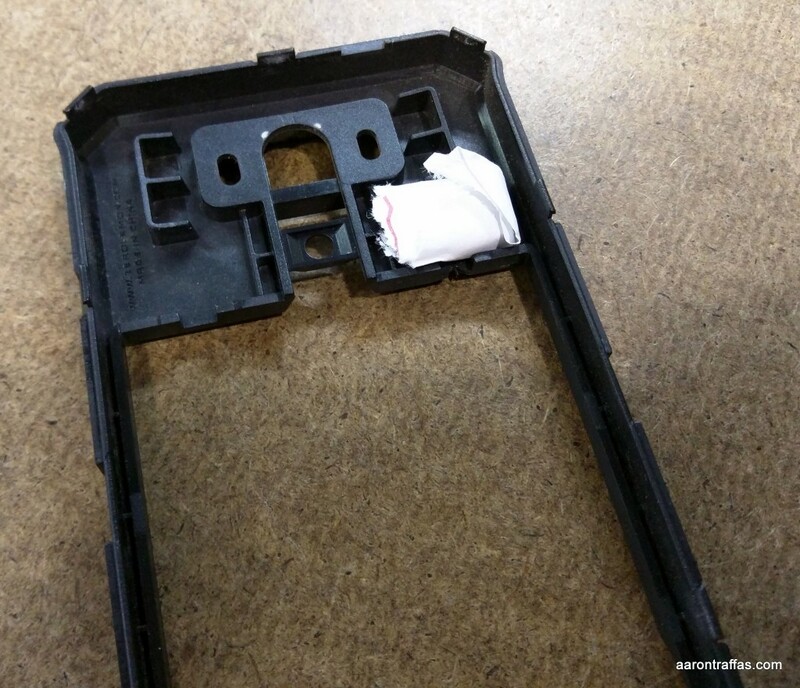 I found that folding some paper and wedging it under the plastic back cover over the contact points was enough force to keep the contact points pressed down. The back cover then fits over the battery and charging coil like normal. Charging works great on stock firmware as well as stock-based ROMs. I’m still hoping the Qi charging for AOSP-based ROMs gets fixed someday. 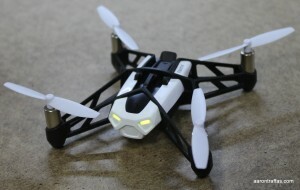 I’ve been watching the development and miniaturization of quadcopters with interest over the last several years. Just a few years ago, I was impressed with the little radio controlled consumer helicopters that would let you say up and down but would always go forward slowly. Now we have quadcopters with gyroscopes and full-blown computer control for under $100. I decided it was time to start learning more about quadcopters, and I was excited when Verizon offered to let me, and my son Nolan, spend a few weeks playing with the Parrot Rolling Spider. The Rolling Spider from Parrot is billed as an “ultra-compact drone” that’s controlled by a compatible smartphone. It uses Bluetooth LE, so any late-model iPhone, iPad, Android phone or Android tablet should work fine. I used my Nexus 7 tablet, but it would have worked just as easily with my Nexus 5, Nexus 6, or my wife’s LG G3. 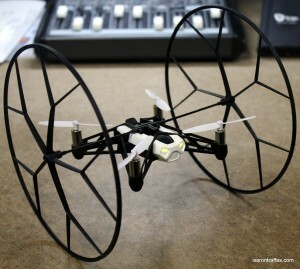 The Rolling Spider is the perfect mini quadcopter for inside the house for two reason. First, with the optional wheels attached, it’s nearly impossible to damage the drone or anything in the house. Second, the computer control makes it very easy to perform only the maneuvers you initiate. Since receiving the Rolling Spider, I’ve purchased another mini quadcopter, and it’s not nearly as easy to control as the Rolling Spider – nor as safe in the house. The mobile app has different control settings, allowing control of the drone either by tilting the phone or tablet and using its accelerometer to steer or by using a more traditional joystick-based control scheme. I tried the tilt-to-steer method a little bit, which is the default control scheme for the Rolling Spider, but it wasn’t as intuitive to me as the joystick method, so I found myself using the standard joystick control scheme most of the time. Controlling the Rolling Spider in joystick mode is dead simple. Tapping the take off icon on the mobile app launches the drone about three feet into the air where it simply hovers. At the end of each instruction – forwards, backwards, left, right, up, down and turn – the craft returns to hovering in place. This is different behavior from other, less expensive, consumer drones on the market, as they lack the ability to automatically hover and can be very difficult to keep stationary in the air. There’s no way around it – the Rolling Spider is a ton of fun. My three-year-old son Nolan loves to run under it and get chased by it. The front of the drone looks like a face with lights for eyes, and it even comes with a pack of stickers to customize the look. 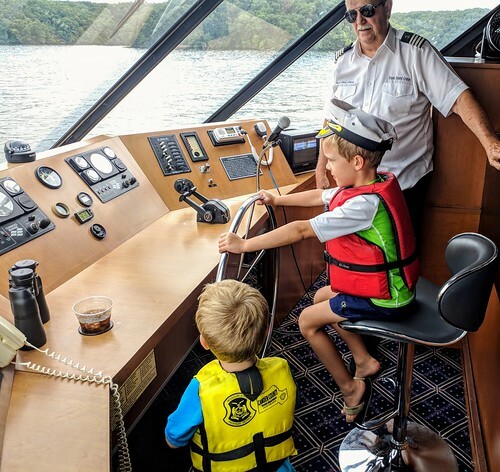 It does have a camera on board, but it always faces straight down and, honestly, isn’t very good. 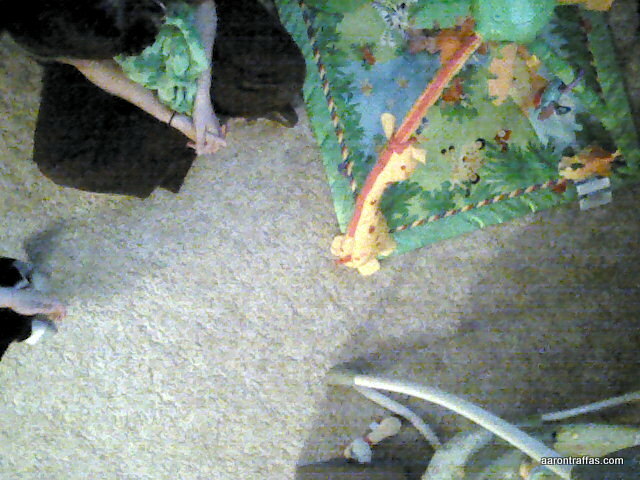 Here’s an example picture from the camera. The mobile app makes it easy to shoot video from the phone or tablet while controlling the spider, which is a great idea, but it’s a little tough to both control the device and hold the controller in a way that will get a good video shot of the drone. Pictures and video might not be the best use for the Rolling Spider, but that doesn’t mean it isn’t versatile. With the wheels on, it’s safe to fly indoors. It can be made to roll up and down walls and across the ceiling, though the best use for the wheels is to protect the drone when it bumps into things. For safety reasons, as soon as the wheels hit something, the motors immediately stop. With the wheels off, it becomes much more maneuverable and is better suited to outdoor flying. The mobile app has preprogrammed tricks that can be executed when the optional wheels are disconnected, such as rolls and flips, which are especially fun to watch. The Rolling Spider boasts a flight time of six minutes with the wheels and eight minutes without them, though it felt like more to me when I took it outside and flew without the wheels. Recharging the batteries takes about an hour. If you’re looking for a great starter drone or just a really fun toy for indoor or back yard play, the Parrot Rolling Spider is an excellent choice. One of the benefits of following @williamshatner on Twitter is that you occasionally get a gem like this. I’m an audiophile. 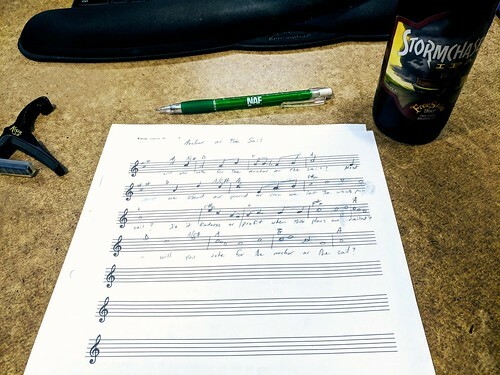 I enjoy consuming well-engineered music. Years of experience with the Aaron Traffas Band affords me the ability to discern quality engineering and production in music. However, I’m also very practical. Because I value convenience over quality, I frequently cut corners in the way that I listen to music. I usually use inexpensive Bluetooth in-ear headsets or stream audio from Google Music through the speakers at my desk. In the last few years, I’ve noticed the emergence of a new type of product that I don’t remember being prominent before. High-end consumer headphones seem to have become a must-have accessory. I’ve been watching them with interest, wondering if the relatively recent explosion in sales was due solely to marketing brands as fashion statements or if the sound quality and features actually justified the eye-popping price tags. My friends at Verizon recently gave me the opportunity to put my ears in the headphones I’ve had my eye on, letting me spend a few weeks with the Motorola Tracks Air by SOL REPUBLIC. 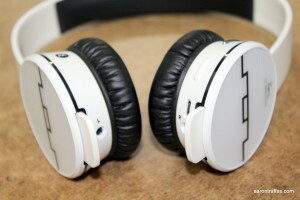 The Tracks Air is the first set of supra-aural headphones I’ve ever used. As such, I can’t compare them to competing offerings by the likes of Beats and Bose. I can, however, evaluate the headphones on sound quality, convenience and comfort. The sound produced by the Tracks Air is its most compelling feature. I forgot how enjoyable it can be to listen to music just to…listen. I’ve always been skeptical of these expensive consumer headphones, as I’ve assumed they’d have built-in equalization that over-emphasized the lows and deemphasized the highs. While the frequency response didn’t sound as flat as my reference headphones or my studio monitors, it didn’t seem as obnoxiously unbalanced as other consumer headphones I’ve heard in the past. I found the audio quality of the Tracks Air to be well-rounded, performing equally well with different genres of music as well as delivering the clarity required for podcasts. 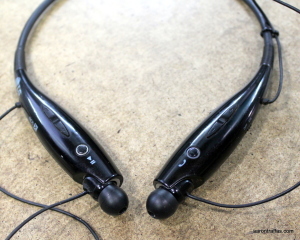 The Tracks Air supports most of the latest Bluetooth technologies, including A2DP and multipoint. I was able to pair both my computer and phone simultaneously, though I did sometimes find it difficult to reconnect my phone without doing a full reset of the headphones. Each time the Tracks Air is turned on, a voice announces the battery life remaining. The Tracks Air boasts 15 hours of battery life from each charge, which makes it easy to go several days on a charge. Call quality was great for me, and none of the people with whom I spoke had any problems hearing me. 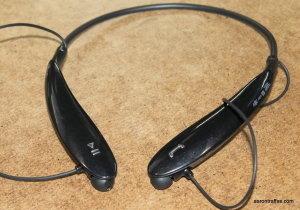 Switching back and forth between music and phone calls was as easy as with any other Bluetooth headset. The weakest aspect of the headphones is comfort. As I said earlier, this is the first and only supra-aural headset I’ve ever used, so I’m going to guess these comments would apply to the class of device and not specifically to the Tracks Air. As I’ve mentioned previously, I listen to podcasts for upwards of 12 hours a day in the summer. The Tracks Air is very comfortable initially and, for at least a few hours, I don’t even remember that it’s there. But after three or four hours of wearing it, I begin to feel the weight and pressure on my ears. For many use cases – on mass transit or a plane ride – several hours is plenty of time. For my situation, however, it’s not something I want to use for more than four hours at a time. All-in-all, I was very impressed with the Tracks Air. My criticisms of the comfort are likely more as a result of the form factor and comparing them to the LG Tone which I can wear comfortably for more than 12 hours straight. 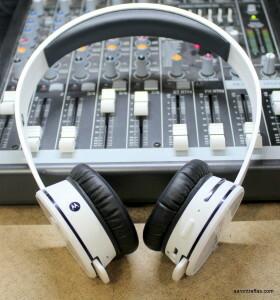 It’s a class of device that’s intrigued me of late, and it did not disappoint with regards to sound quality or features. 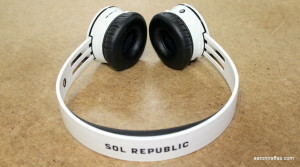 If I were looking for a high-end Bluetooth on-ear headphone with great sound quality and features, I’d definitely go for the Motorola Tracks Air by SOL REPUBLIC. I was asked to sit in again on MobileCupOfJoe‘s What’s Brewing? show. We talked about OnePlus, CyanogenMod, the Sony hack and more. Enjoy. I spend the majority of the waking hours of each day with a podcast playing in my ear. 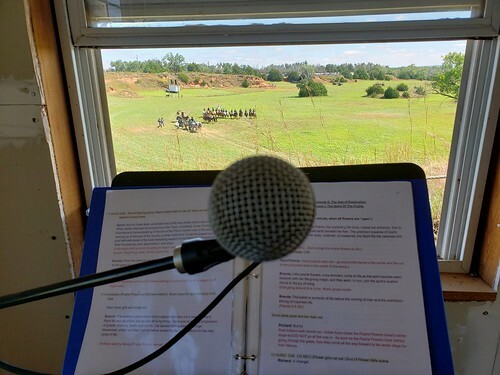 While I’m farming, I use two headsets for different purposes. I use the Motorola S10-HD when I’m working on or under equipment because it doesn’t fall off my head. The rest of the time, I use an LG Tone+. I’ve found the Tone+ to be light and amazingly comfortable, as well as very easy to quickly insert and remove from just one ear while wearing it. Wearing comfortably with just one ear is crucial for me, as I need to hear the equipment I’m operating with the other ear, so the Tone is superior to alternatives like the S10-HD and the BlueAnt Pump because they really can’t be worn comfortably in just one ear. I bought my Tone+ in the summer of 2013, and it lasted through that season, through the winter and through the 2014 season. For someone who is as tough on devices as I am, that lifespan is a demonstration of very impressive durability, especially considering that the headset was in use for an average of 12 hours each day. I’d turn it on at 6 a.m. when I left the house and run it until the battery ran down, which was usually about 12 hours later. As my Tone+, model HBS730, began to age, I began wondering if some of the other models of the LG Tone series might prove superior to my Tone Pro. I ordered a Tone Ultra, model HBS800, a couple months ago. Then, recently, Verizon asked me if I’d be interested in testing the LG Tone Infinim, the HBS-900. 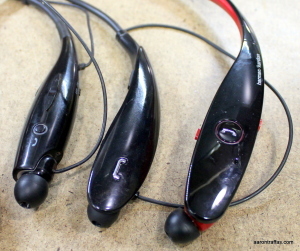 What follows is a comparison of these three headsets, the HBS730, HBS800 and HBS-900, with a focus on usability. Each headset features a play-pause button on the right and a call button and charging port on the left. They all have equalizer preset modes, allowing selection among normal, bass boost and treble boost modes. While I haven’t tested the Ultra and Infinim for months on end like the Tone+, I’ve found no problems with battery life, with each model seeming to do at least better than 10 hours for constant audio playback. Near and dear to my heart, the Tone+ has proven itself over the last year-and-a-half. The volume rocker is on the superior, or top, left and the tract selection rocker switch is on the superior right. 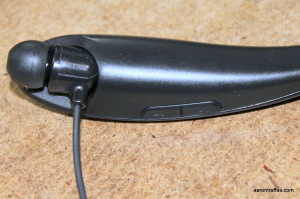 The power switch is on the left, but, unlike the Ultra and Infinim, it’s on the distal side, facing away from the neck instead of the proximal, or inside, side of the headset. I’m not sure why later devices moved the power switch to the proximal side, but the Tone+ definitely has the best placement of the power switch. The sound quality is adequate. The default EQ mode was always good enough for me, as I don’t demand pristine audio quality, especially for podcasts. When I do focus on sound quality, I find the sound of the Tone+ to be the worst of the three units compared here. It’s slightly muddy in each of the three modes, with no real way to shape the mid-range response to my liking. Having said that, for anyone but the most discerning audiophile, the sound from the HBS730 is certainly good enough. Where the Tone+ was essentially flat in shape, the Tone Ultra has a pronounced curve to it, obviously in hopes that it fits more comfortably about the neck. I never had a problem with the comfort of the Tone+, so this shape change seems like a solution in search of a problem. However, I can’t complain about the comfort of the Ultra. What I can complain about is usability. The Ultra is unquestionably the hardest of these three models to use. The buttons are simply harder to get to and harder to use. The power switch has been moved to the proximal side. The volume and track selection rocker switches have been moved from the superior to the distal sides of the left and right sides, respectively. These rocker switches are much more difficult to get to and, where I could easily operate the rockers with gloves on the Tone+, the Ultra requires a fair mount of fine motor skills just to adjust the volume or track. Additionally, the call and play-pause buttons, instead of being round, are shaped like icons. I’m not sure if it’s the change in shape of the buttons or the change in shape of the magnetic earbud holders that leave them more open on the dorsal side, but these buttons are difficult to use compared to the Tone+ unless I’m holding my thumb on the back side to use as counter-pressure. The sound quality of the Tone Ultra is branded as JBL, and while it’s noticeably better than the Tone+, it’s not good enough to offset the nosedive in usability and additional cost of the Ultra over the Tone+. The Tone Infinim has some significant differences from its predecessors. The Tone+ and the Ultra have thin, flexible neck bands, while the Infinim is a a thicker and harder plastic with a flexing region of just a couple inches in the very back. The added weight adds a premium feel. The next most significant difference is the change to the earbud cords. The Tone+ and Ultra feature fixed length cord that emerge mid-way up the neck and are held in place at the left and right ends with magnets. The Infinim has much thinner cords which actually retract into the headset, so when they’re fully retracted there is no cord showing. While it’s convenient when charging or transporting it to have the cords retracted, I’ve found that, because the cords emerge at the ends of the left and right sides instead of mid-way up the neck like the Tone+ and Ultra, it actually results in a longer cord that’s exposed when in use. This additional cable length is inconvenient when I pull the earbud out of my ear temporarily as it is just more cord to catch on clothing or other obstacles. As I’ve been caring for my two-month-old son for the last few weeks, it’s certainly less convenient than the Tone+ or Ultra to have the longer cable dangling for him to grab and try to eat when I’m holding him. 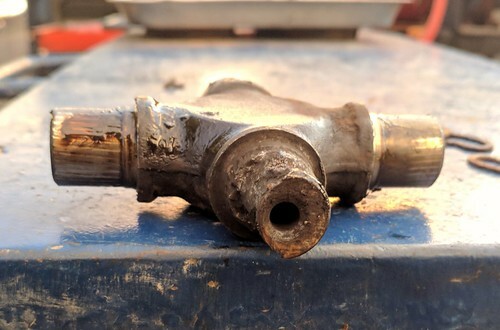 It’s also more arduous to have to operate the retraction mechanism than it is to simply return an earbud to its magnetic holder with the other two models. The buttons are also different. The play-pause and call buttons are round, but, unlike the Tone+, they’re recessed. I can see them being harder to use with gloves than the Tone+. Also, instead of rocker switches for volume and track selection, the Infinim uses sliders. While the sliders are more usable than the rockers on the Ultra, they’re still more cumbersome than the controls on the Tone+. The sound quality of the Infinim is the best of the three models. It’s branded as harman/kardon and is a noticeable improvement in clarity from the other two models. The highs are clearer on all three preset modes and the mix feels balanced and much less muddy. Each headset handles Bluetooth multipoint, which, as an example, allows it to pair with a phone and a tablet simultaneously. I use this feature on my Tone+ extensively in the tractor cab. They also feature other gimmicks, such as voice actions and the ability of the Infinim to read back the time. At the end of the day, I’m looking for a quality headset with excellent usability and acceptable sound quality at the lowest price. The version of the Infinim Verizon sent me is red and black, while the only color scheme listed on LG’s website is silver. The lack of a black version is a deal-breaker for me, as is the price tag, which is, at the time I’m writing this review, about $150. If I had only a desk job, the controls on the Infinim, as well as the unique retractable earbuds, would be fine. I’m afraid that I just wouldn’t be happy with the Infinim for my use on the farm. However, if you want the best sound possible, don’t have an industrial application and don’t mind the red or silver color schemes, you can’t go wrong with the LG Tone Infinim. What would I buy? I just bought a bucket of Tone+ headsets – one as a backup and the rest as stocking stuffers for family. At a fraction of the cost of the Infinim, and with much better usability than the Ultra, the Tone+ is an amazing value for a dependable, durable headset with good sound and amazing battery life. 89 queries in 2.248 seconds.